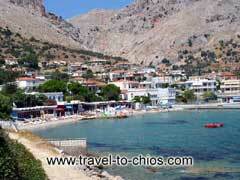 Vrontados is one of the biggest settlements on Chios island. It is situated on the north -east side of the island and has many beautiful coasts for those who love swimming and sunbathing. Among them is the bay of "Ormos Lo". It is a private beach, very well organized, for a place of its kind, with a basketball field and swimming pool, where you can play water -polo. Moreover, here you can become a member of a sailing team that had been many times taking place in races and award a prize. Finally, there are many locker -rooms. From the other side of the beach you can enjoy swim and sunbathing, with your friends and family, as the coast consists of fine pebbles and the bottom of the sea is full of sand, an ideal place for the children to play and the parents feel comfortable and relax. Also at the north part of the beach there is a restaurant where you can have lunch and dinner and other events.